Since it always appears easier to solve other people’s problems than it does to solve our own, I’ve decided that — until further notice — I’m going to pretend to be someone else. 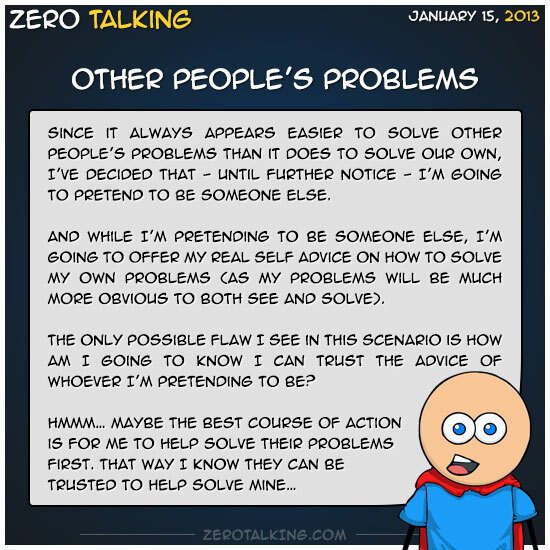 And while I’m pretending to be someone else, I’m going to offer my real self advice on how to solve my own problems (as my problems will be much more obvious to both see and solve). The only possible flaw I see in this scenario is how am I going to know I can trust the advice of whoever I’m pretending to be?